Writing about the visual arts is a perilous affair because it relates two distinct ways of creating meaning, images and discourse. In this context, any criticism disguised as ‘philosophy’ of art tends to explain away images by means of concepts: difference here and there, the Event now and then, the Ereignis in this or any pair of shoes (Heidegger on Van Gogh), etc. This subordination of images to concepts is a by-product of speculative thought. Another possibility is the experimental-associative approach where the artwork is not so much reduced to a concept – the critic as Cicerone of a modern gallery – but becomes an occasion to comment on the state of the world, its fixations, challenges and problems, etc. Remember Gustave Flaubert: when asked about the possibility of illustrating Madame Bovary he wrote that ‘the illustration is anti-literary. You want that the first imbecile who comes in draws what I’ve exhausted myself not to show.’ If Flaubert were a painter he could have written: ‘criticism is anti-artistic. You want that the first imbecile who comes in explains what I’ve exhausted myself not to say.’ How to write about art without becoming this imbecile thinker who – in the best case – knows a half a dozen philosophers and is an active ‘lover’ of art? The relevant question for a model of art criticism is not how to explain away art by means of concepts but how to relate to art as a way of explaining the world. In this context, an artwork is not an object to be interpreted by the rigorous art critic but an actor that is somehow related to the broader ‘conversation of mankind’ (Oakeshott). In this context, a pertinent project of contemporary art criticism is neither virtuosic rhetoric nor philosophical speculation. Arguably, it consists in the identification and description of how a given artwork can alter our perspective on the world by means of feelings, sensations and ideas. Can art change our preconceived memories of a place or an object? Can it provide figures of thought and expand our sensibility so that we understand ourselves better? Maybe the artwork is not a miniature of the philosophical concept but an opportunity to see the world’s unforeseen potential dimensions. Divination and magic are the two structuring motifs of Cultivating Probability. Foretelling the future is an act of magic yet magic is not always about predictions. Whereas in antiquity prophecy was a divine ‘gift’, in modernity the future is ‘calculated’. 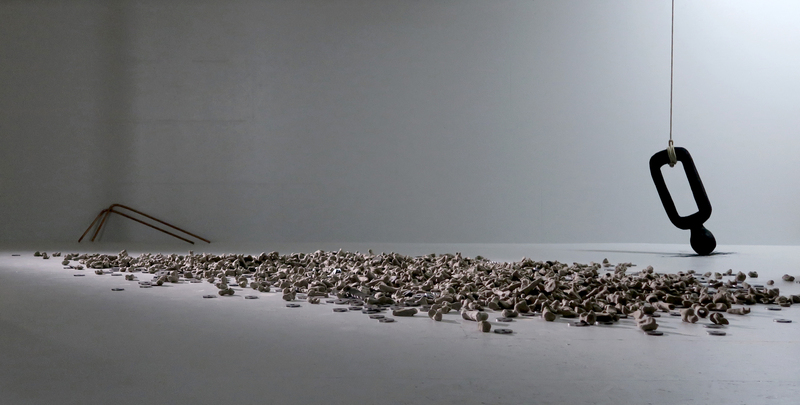 Hence, the regulative polarity that Marjolijn Dijkman’s installation exploits as film, sculpture and sound: the indeterminacy of the magical event vs. the determinacy of reason that calculates and predicts. The fine exploitation of the border between determinacy and indeterminacy turns the installation into an opportunity to reflect on a relevant cultural problem, namely the different ways in which one can understand enchantment. On the one hand, there is the ‘primitive’ enchantment with magic as an unexpected happening or as the realisation of a premonition. On the other hand, there is the modern regime of magic as enchanting entertainment and persuasive seduction; the media is full of ‘unexpected’ encounters that fascinate – fascinum as phallic evil spell – and entertain, like magicians and bewitching spectacles. How did we come to this situation? In order to become modern, humanity represses the magic in life as an illusion and perceptive error one is aware of. Benjamin Fondane pointed out that modern man tolerates superstitions and contradiction as necessary ‘decommissioned truths’ (vérités désaffectées). For the ‘primitives’, there are no such tolerated ‘non-beings’ opposed to absolute truths: the world contains all beings and everything is part of truth. Nowadays, the border between ‘fascinating’ art and ‘enchanting’ entertainment is fluid; an ambiguous slide connects these two regulative meanings on magic: once upon a time, visual art stole the magic spell of religion, while recently entertainment took over its enchanting power. Only for classical aesthetics was this gradation between enchantment and art a problem. The reason is precisely the fact that what used to be called ‘art’ denoted artefacts freed from their ritualistic, religious or superstitious context. Just as the archdeacon Claude Frollo complained that the printed book killed the cathedral (Hugo), the museum killed the Sunday ritual; aesthetics, archaeology and philosophy played their part in this civil bracketing of art and magic. Despite this necessary distinction, both art and magic are creative acts yet – as Claude Levi-Strauss once pointed out – they represent two different relations to structures: art starts from various objects and reveals their structure vs. myth begins with the structure that it dissipates in a myriad of rituals. This relation should be conceived as a gradation that expands in other domains of life: there is magic in art and myths, but also in our encounters with the world. While interpreting objects found in ethnological museums, Cultivating Probability shows figures of the human attempt to grasp an incalculable future. Foretelling and calculating the future are magical acts because in both cases something is not materially present and has to be either revealed or abducted: an unexpected phenomenon can always disturb the balance between induction and deduction, between what is given now and what is already known. Magic is that symbolic attempt to grasp a future that is not yet given while reading it in revealed manifestations. The parallelism between art and magic is comprehensible: they both require a ‘shamanic vocation’ (Eliade), a speculative taste that works with ambiguities, that is to say, with an uncertain future. Maybe magic is just a way of dealing with the unknown future or with the calculation of the right moment when a decision is made, the Kairos. However, speech has its own choreography: pixilated hands perform a plethora of gestures that explain, convince, order or manipulate. The video In Our Hands dissects the gestures from the level of a quotidian parole and presents them as digitally coded, transmissible and adaptable to the eventual dialogue between man and machine (or a machine with bodily human characteristics). (fig. 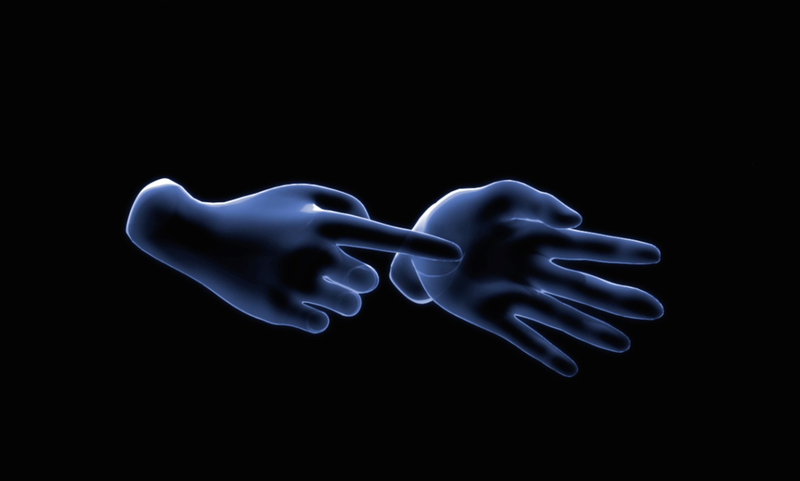 4) In Our Hands is an experiment in disembodiment. After all, human communication implodes with paralinguistic features like intonations, gestures, tonality, etc. Especially hand gestures and tonality – remember the ‘grain of the voice’ (Barthes) – are crucial elements of human communication that convey conviction, elements that direct the intentionality of the listeners. 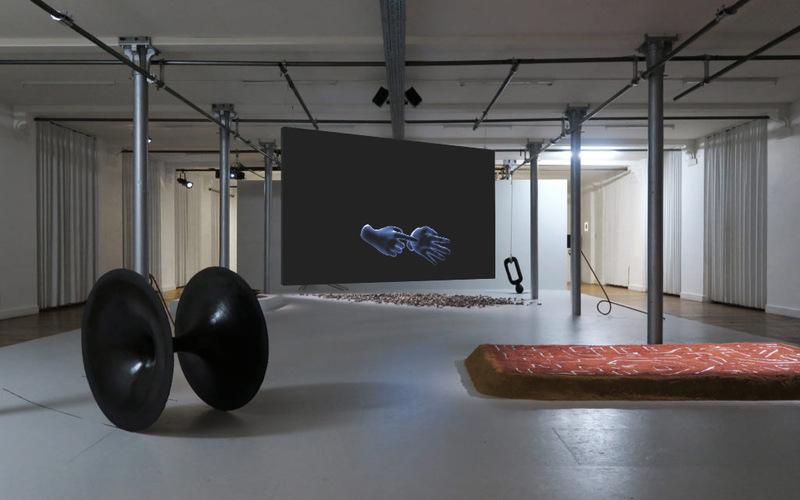 The installation abstracts these elements and presents them in their digital semblance, the sensors ‘perfectly’ emulating the hand gestures: the body is reduced to a multiplication of pixels; the body is no longer there as weight, it is there as data. The burlesque predispositions of human rhetoric become the deadpan computation of a digital screen. The sound of the accompanying brainwaves is the punctum of the installation as they make us wonder: is this how the so-called ‘affects’ sound like when disembodied and amplified? In a certain sense, Liz Magic Laser’s Stand Behind Me (2013) performs the reverse movement of In Our Hands; they work dialectically on each other: one turns the body into a screen; in the other, a hypnotizing Ariel Freedman embodies speech, performs its singular physical presence, a culture of the Leib (as Germans would say), the living body. The work is a conductor as it extracts, translates in pixels and digitally transmits an analogue bodily presence, seductive and manipulative, skills that machines still have to acquire. Foretelling becomes a desperate attempt to read and solidify the future in tin signs on an otherwise perishing yellow sand (fig. 5) or to leave readable traces behind a randomly moving toll (Fig. 6). While the curvature of space-time-matter stays on the floor, the interior of this machine echoes a black hole, the point of no return. These installations seem to transfer a ‘primitive’ magical indeterminacy into a modern industrial processing that includes chemicals, metals and electricity. A little drama is staged in any act of magic or divination: the future that is supposed to be written and read is disproportionally larger than what the magician-artist with her instruments can read. The magician-artist can imagine figures of the future and map them out – as Claude Levi-Strauss would say – like a miniature that compensates for the small-scale diagram by providing ‘intelligible dimensions’. If a sign is an entity that reveals an aspect of an object while concealing another, then all representations have something minimally magical about them: each word or image reveals while concealing. Art historians like Riegl and Warburg understood that astronomic representations are attempts to structure the world, to magically control the uncertainty that makes life unbearably human. Recently, shamans have transformed their activity: the ritualistic hallucinations have turned into predictive stock forecast algorithms. Reading the stars in the sky and on the stock market are similar at least at the point when one tries to find a pattern that will most likely influence one’s life. Divination is an anticipatory leap forward of consciousness minus the complete grasp of what will come. The art of divination consists in the portrayal of the future while it adapts itself to the mind. Marjolijn Dijkman’s sculptures are imagined miniatures of divination, the figures and gestures of the desire to read the future. ‘Magic’ can mean different things: on the one hand, there are the strategies of markets where to foretell – combining algorithms and astrology – means to manage and transmit information for profit. Here magic means the miraculous trick and deceptively incomprehensible act that is meant to calculate the future. In this context, Cultivating Probability frames this transcultural desire to control and stages a few figures of uncertainty, indeterminacy and ambiguity. The probable is the unpredictable side of life and the latter stays human as long as its possibilities are not completely determinable. Maybe the installation shows that the indeterminate is human, essential to both enchanting art and the artistic magic. Maybe contemporary art can be some provisionally plausible and incomprehensible debris that philosophy cannot sublate into a concept (Adorno) or an asset on the market. Meditating on creation and magic, Paul Valéry could not have better explained this condition: ‘We are like the spectators of a conjuring performance. Some admire the trick as such and for as long as it is incomprehensible and the others as far as they figure out the scheme. For these, if the miracle is real, the show loses all interest. It enthrals, it “moves” – but it has neither meaning nor importance for us – only for our nerves.’ This is a different meaning of magic, an unexpected and unexplainable event that affects the spectator, the hope that something escapes the instrumental reason and its seemingly magical spectacles. Something has to remain unexplained in order to be felt as magic. The notion designates here the artist’s proclaimed desire to experiment, to disclose perspectives on the world that we have not seen yet. Marjolijn Dijkman does not so much create as she transforms; as Valéry remarked the notion of ‘creation’ is magical, weak and not ‘exciting’. It designates the evolution of a stage into another as if by miracle – the word complies with the cliché of the genial and original artist. Transformation denotes the modern practice of appropriation, defiguration and reconstruction: the artist who stages the figures of divination. In this sense, the installation is a question: how does the culture of probability shape human life and how has cultivating probability become intrinsic to our place on earth? Cultivating Probability cherishes the desire that makes humanity an indefinite and endless phenomenon, like a child enjoying its inability and refusal to understand the machine behind a magic act. Artefact: The Act of Magic explored how we can understand magic and the magical in contemporary society. This inherently ambiguous concept evokes notions such as illusion, enchantment and awe, but is equally related to a deeper understanding of magical powers, the occult or supernatural, rituals and animism. It calls forth a range of interpretations on a continuum from pure illusion to a deep belief in a parallel world full of magical powers. Cultivating Probability (2015) consists of a collection of 6 individual sculptural elements. Materials: Wood / black engine grease / 90 x 90 x 70 cm; burned wood / Ink / 50 x 80 cm; handmade unbaked clay objects / metal binary tokens (approx. 2500 in total); metal dish / water / ink / electromechanical motor / diameter 1,20 m; full copper / 2 cm diameter x various lengths; burned yellow sand / tin / Sound composition: 17:40 min. In Our Hands (2015): HD Animation film, duration film: 9:20 min.